Here’s who’s playing this year’s FADER FORT, our annual showcase of great music. From March 16-19, the FADER FORT Presented by Converse will make its return to Austin, Texas. The complete lineup—including Metro Boomin, Kacey Musgraves, Rae Sremmurd, Davido, Yo Gotti, Sheer Mag, and many more—is in the video above. The video stars Bootymath, Atlanta's Twitter renaissance man. The lineup is also listed by day and set time below. All times are CST. The FADER FORT is a private, invite-only event. Wristband pickup information will be posted on Friday, March 11. This year we've partnered with Converse for the fifth time to help make this our best FADER FORT yet. 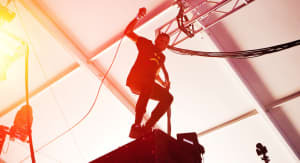 The music portion of the FADER FORT will stream live in on TheFADER.com. This year, the FADER FORT is also made possible by Toyota Prius, Getty Images, Jack Daniel's Tennessee Whiskey, Budweiser, Red Bull, and SiriusXM. For updates on The FADER FORT, follow The FADER on Snapchat at 'fadersnaps', Facebook, Twitter, and Instagram.